It's been quite awhile since making any cheese, and last night I decided it's time to get back on the horse (or goat, as it were). We had a gallon of Whole Goat's Milk in the fridge, ready to go--the plan was to make another Chèvre, but I wanted to branch out a bit more and try something different. But, we also wanted to eat it right away! A few pages further into Ricki's book, we found her Whole Goat's Milk Ricotta recipe. Perfect! A cheese purist will tell you that's it's not Ricotta if it's not made from Whey, but this recipe calls for just a gallon of whole goat's milk -- no whey. Ricki acknowledges this discrepancy, but then moves past it, with the implication that's it's darn tasty, so who really cares? I'm inclined to agree. This recipe actually reminds me a lot of the Lemon Cheese recipe: Heat some milk, add a bit of acid, and drain the curdled cheese. Couldn't be much simpler. Heat the milk to 195F, stirring constantly to avoid scalding. Turn off the heat, and slowly add the vinegar, stirring slowly and thoroughly. (Ricki's recipe suggests that if it's not curdling properly, instead of adding more vinegar, increase the temp to 205F--but be careful not to boil.) Allow the curds to set for a minute or two. 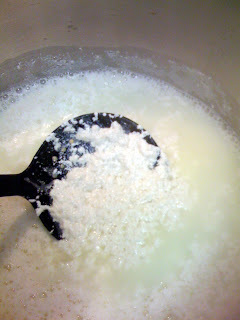 Once the milk has curdled, and there's a clear separation between the curds and whey, ladle the curds into a colander lined with butter muslin. Tie up and allow to drain for about a minute. Place in a bowl, and mix in the butter and baking soda. That's it! The recipe didn't call for salt -- an odd omission, I think. After mixing in the "butter" and baking soda, the salt took it from bland to grand! Goat's Milk Ricotta on whole wheat penne. 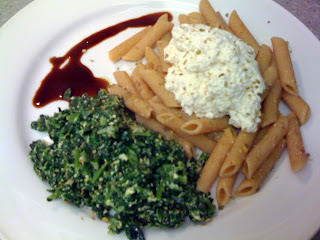 Sauteed organic spinach with olive oil, garlic, crushed red pepper, a few spices, and dollop of the ricotta melted in. Drizzled with Cavedoni Botte Piccola Italian Balsamic. I've made that same recipe from raw goat's milk. I couldn't understand the need for the baking soda and butter, and didn't particularly like the result. I much prefer the whole milk ricotta recipe in her book for cow's milk. Works great with my raw goat's milk. I agree. The whole milk cheese is rich enough without adding the extra butter... Especially once it's been in the fridge (when it's cold it seems even richer). And I'm not really sure what benefit the Baking Soda adds, either. That looks delicious! 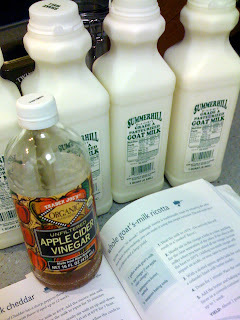 I've used that very goat's milk--out local Trader Joe's carries it. I can see where it could make lovely ricotta but the chevre that I attempted was a disaster. I've decdided to stick with the fresh, raw milk that I buy from our local goat guy as I've never had anything go wrong with his milk. What happened with your Chevre? I've used that brand from TJ's for Chevre a couple of times with great success... What went wrong on yours? Side note: I've gotta find a good local source. Anybody know of one in West Los Angeles? 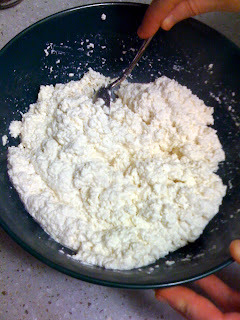 Ricotta should stay good in the fridge for about a week or so, maybe a little longer. Honestly, I've never been able to keep a ricotta in the fridge more than a couple of days, because I finish it by then! Maybe s silly question. Can the goats milk be substituted for cows milk? However I do not have access to 'raw' milk just yet so wanted to experiment with milk from the supermarket. Yup, you can make most cheeses from Goat's or Cow's milks. The textures may come out slightly differently, though, so some experimentation may be necessary. You don't need raw milk for any cheeses. "Pasteurized" milks are fine. However, you cannot use "Ultra-Pasteurized" milks -- they won't work. Yum! Just made this and it was so easy... I was so happy with the result! I had a couple spoonfuls while it was still warm. I could taste the baking soda a bit though. Do you know what purpose the baking soda serves? My goat's milk is cultured- it's raw and has gotten slightly sour but isn't bad.. could I use it for this recipe? Sorry for the late reply... by now I'm sure your goat's milk is completely unusable! In general, it's best to use the freshest possible milk for your cheeses... they'll always turn out better. Hope that helps! "Skier's curd cure stumps cheese whizzes"